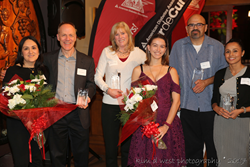 The American Diabetes Association of the Greater Los Angeles area celebrated the year’s accomplishments and recognized the dedicated efforts of several Los Angeles area volunteers at its annual Volunteer Recognition Reception held on Dec. 6, 2017 at the San Antonio Winery in downtown Los Angeles. I am very proud to be a part of the American Diabetes Association and to take this journey with all of you towards what will hopefully be the end of diabetes. “This year almost 5,000 people, walked, ran, cycled, golfed… drove classic cars and did many other activities too numerous to mention, so they could raise funds and otherwise support the American Diabetes Association here in Los Angeles,” said actor Jack McGee who served as emcee for the evening’s event. Recognizing volunteers for their contributions is vital to the continued success of the Association and the ultimate goal to stop diabetes. “I am very proud to be a part of the American Diabetes Association and to take this journey with all of you towards what will hopefully be the end of diabetes,” said Interim Executive Director Southern California Julian Dillon. Diabetes is a serious public health crisis affecting nearly 30 million Americans living with the disease and is the sixth leading cause of death in Los Angeles County, according to a report by the California Department of Public Health. Last year’s release of a UCLA health study discovered that 55% of California adults have either diabetes or prediabetes, the latter being a condition in which blood glucose (sugar) levels are higher than normal but not high enough to be considered Type 2 diabetes. Muñoz announced the Association will merge two signature fundraisers in 2018: Step Out Walk to Stop Diabetes and Tour de Cure. Participants will be able to walk, run, ride or run and ride at one super event, which takes place at the Santa Fe Dam Recreation Area on Sunday, Oct. 14, 2018. -- Evelyn Cubias named the 2017 Community Heath Volunteer of the Year. -- Lenny Isaacs received the 2017 Volunteer Leadership award. -- Leslie Kreuzberger and Eddie Uribe received the 2017 Volunteer of the Year awards. -- Cassie Nuñez recognized for her third-party event fundraising. For more information call the American Diabetes Association at 1-800-DIABETES (1-800-342-2383) or visit http://www.diabetes.org. The American Diabetes Association is leading the fight to Stop Diabetes® and its deadly consequences and fighting for those affected by diabetes. The Association funds research to prevent, cure and manage diabetes; delivers services to hundreds of communities; provides objective and credible information; and gives voice to those denied their rights because of diabetes. Founded in 1940, the Association's mission is to prevent and cure diabetes, and to improve the lives of all people affected by diabetes. For more information, please call the American Diabetes Association at 1-800-DIABETES (1-800-342-2383) or visit diabetes.org. Information from both of these sources is available in English and Spanish. Find the Los Angeles office on Facebook (adalosangeles), Twitter (@ada_losangeles) and Instagram (@adalosangeles).